Living through the cold and harsh Minnesota winters can be hard enough, but when your furnace breaks down, there’s no end to how tough a Minnesota winter can be. When time counts and you want to spend it with your family, you shouldn’t have to worry about whether or not your furnace is going to break down or need service. The average life expectancy for a typical furnace is about 14–20 years. As a precautionary measure we recommend that you have your furnace checked every year. This will ensure that your furnace is running at full capacity. Frequent check-ups also help identify whether or not your furnace needs to be replaced entirely, preventing any unexpected break-downs. 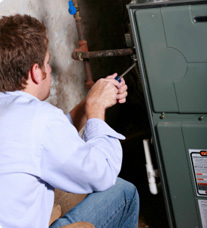 Our trained Minneapolis furnace repair experts can assist you in determining what furnace repair would be necessary. We also offer an online furnace assessment to get you started! Our installers are fully licensed, and they make sure that they abide by all city codes and permits. Deans Plumbing, Heating and Air is backed by over 35 years of heating experience. When you are ready for a home furnace installation, it can be a difficult and confusing process. It is important to make sure you get the right equipment, and the right contractor, when making such a major purchase. Our professionals will provide timely, professional and accurate manufacturer-authorized service for your Minneapolis furnace installation.